MailChimp Alternatives: Who’s the Best? MailChimp is great and is actually our recommended email marketing software for small businesses. However, when you are ready to take your email marketing to the next level, there are just some things that MailChimp is not equipped to do. You will need to opt for a more feature rich solution if you want to boost your email marketing efforts. In this article we will cover 6 MailChimp alternatives, so that you can find the one that is best suited to your specific needs. 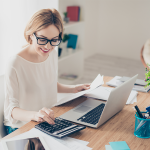 There are hundreds of email marketing software available, so when considering the top MailChimp alternatives for small business owners, we looked for options that offer a feature or functionality that MailChimp either doesn’t have at all, or does not excel at. 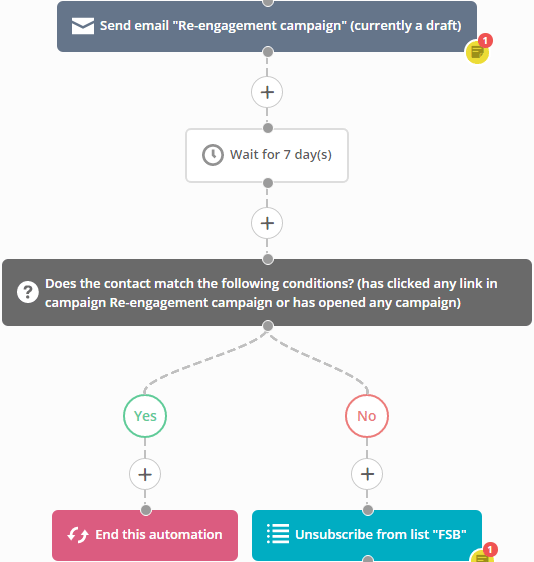 Marketing automation – Allows you to send emails based on a subscriber’s actions. For example, you can set it up so that an email is automatically sent when a user first signs up for your newsletter, when they haven’t opened an email for a number of days, or when they click on a specific link in your email. Advanced tracking and reporting – While most software offers open and click through rates, a few get more detailed on the reporting and tracking. This includes information on what time and at what location a person opened an email, month over month interaction rates, and detailed information on which links are getting the most clicks. E-commerce solutions – This is important for ecommerce stores that sell multiple products. You can set it up so that emails are sent when a user abandons their cart, send targeted emails based on a customer’s previous purchasing history, and send emails based on how much the user has spent with you. 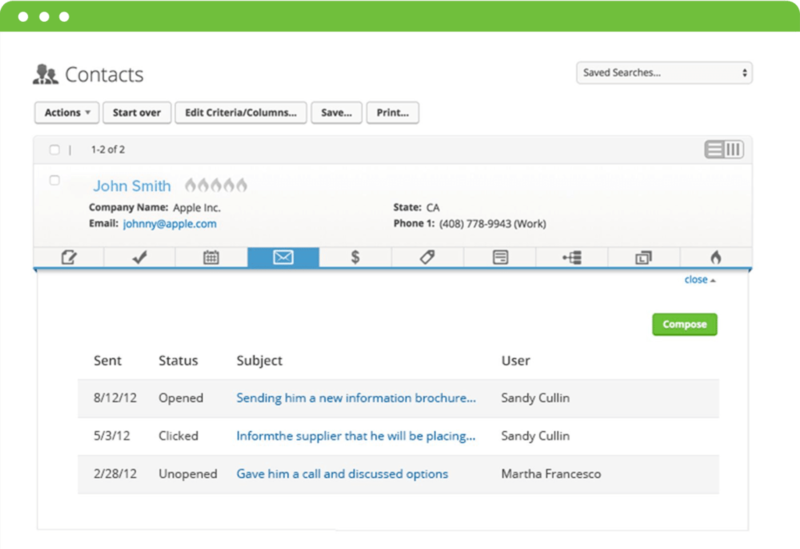 CRM capabilities – Great for salespeople because it keeps all of the information on your customers in one place. This helps when you are trying to convert users since you know exactly when and how often they have interacted with your company. All of the email marketing software in this guide are great, but the right fit for you depends on your type of business, how much you are willing to pay, and what functionality is most important to you. In this guide we will go through each and point out who the software is right for, and highlight the differentiating features. People trying out email marketing for the first time. Constant Contact is super easy to use, and therefore recommended for people just starting out with email marketing. Though the price is a bit steep for the features you get, the simplicity is great for creating emails and interpreting the tracking and reporting. Unlike MailChimp, there is also customer support available via phone or chat all day Monday-Friday. 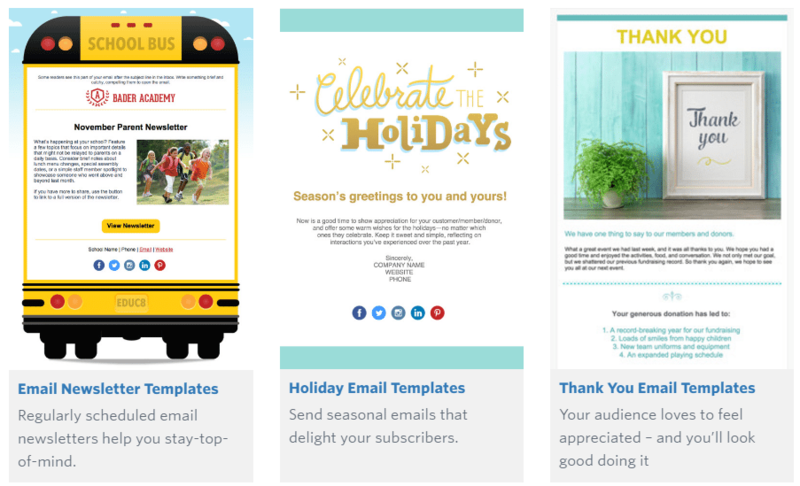 Send an unlimited amount of nice-looking, predesigned emails to your subscribers. With the pro plan, you will also be able to send automated emails and customized surveys. Read our Constant Contact review to learn what their users think of the company. 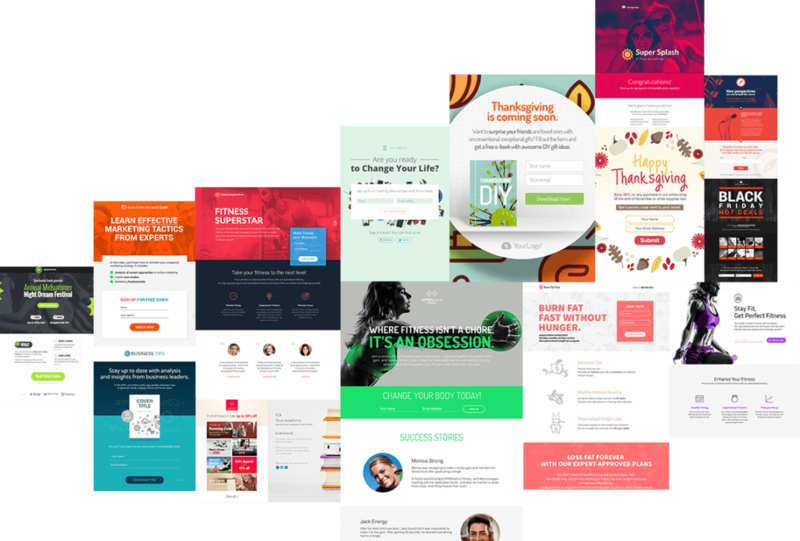 Small to medium sized businesses that want an easy way to create targeted landing pages based on the email being sent to subscribers. Create mobile responsive landing pages by choosing from hundreds of templates. This helps increase email conversions as you can send people to a page with one specific call to action that is in line with the email you sent. GetResponse also allows you to create and market webinars to keep subscribers engaged (pro plan). Online marketers who have a ton of content they want to send to specific subscribers based on how they are interacting with the emails. Advanced marketing automation that allows you to push out content strategically to make sure you are targeting the right people at the right time. For example, let’s say you want to re-engage subscribers who have not opened an email in 30 days, and if they still don’t engage, then you want to unsubscribe them from your list. This would look like the flowchart below. As you can see, it is very simple to understand the flow and easy to add different conditions. We use ActiveCampaign at Fit Small Business and recommend it to bloggers, software as a service (SAAS) companies, and any other online business with a lot of informative content. Stores that sell multiple online products. Klaviyo was built with e-commerce in mind so it’s templates include abandoned cart emails, win-back emails and more. Salespeople and ecommerce businesses with a lot of data on customers that they want stored all in one place. Infusionsoft is a combination of an online store, customer relationship management (CRM) software, and email marketing. This makes it a very powerful all in one email marketing solution, where you will have a lot of data about each subscriber in one system. With this ability comes a steep learning curve, which is why you will have to purchase a $999 package to help you get started. Advanced content marketers who are well versed and dedicated to email marketing in order to fully take advantage of the powerful features. It combines your content management system with email marketing and sales to create personas for all of your subscribers. Then you can target different content at different times through different devices depending on what you know about that person. Email marketing is a powerful marketing tool for small businesses, and it’s key to choose the software that fits your specific needs. 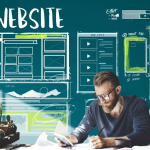 Outline what you need from your email marketing software, and then test out a few of the top options so you can get a feel for which one is best for you. Once you have picked the solution for you, it’s time to start sending out emails! 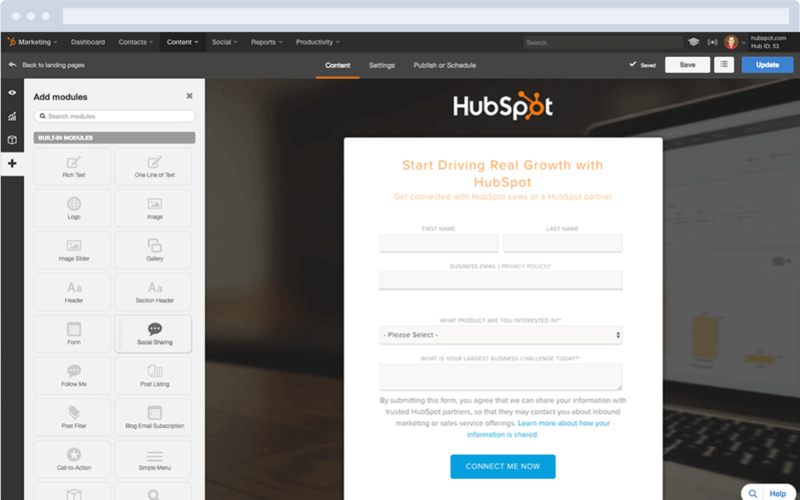 View our email marketing best practices to help you get started. I guess one of the most important factors for small businesses while choosing an email marketing service provider is price. Most of providers do not allow users to use all features even in their smallest plans and you have to upgrade, which is a real pain when you are still growing your subscriber list. I have been using MailChimp, which I really liked, however, I have switched to MailerLite as it was easier to use and also cheaper. It has all advanced features like automation, tagging by groups, even a/b tests, landing pages, integrations with e-commerce. Here is the full feature list: https://www.mailerlite.com/full-feature-list . Another suitable choice for a small business I would see ConvertKit, it seems like a nice service (didn’t try it yet), but a bit more expensive. Those two – MailerLite and ConvertKit would be a great fit to the list though. Another couple of things which as a small business owner you want it good open rates and a simple but complete software. You don’t want to pay $19 or $99 for different subscriptions like popup, landing page or email automation. Like you, I also migrated from MailChimp to SendX ( sendx.io ) close to over a year and have been a happy customer ever since. They also have a feature-by-feature comparison which you may find helpful ( sendx.io/kbase/mailchimp-alternative ). If I may ask, what business are you in ? And how do you use email marketing currently?